For people who are looking at setting up a home aquarium, this site offers advice on choosing out all the essential aquarium supplies to create a thriving aquatic ecosystem. Aquariums can be fun to keep and very relaxing to watch. We offer advice that will help reduce the frustration that can come when setting up a new home aquarium. The Home Aquarium Buyers Guide! Keeping aquarium fish can be fun and a home aquarium can add tranquility to the room that it is located in. There is a lot to know when setting up a home aquarium and it is wise to do some research before making any purchases. A home aquarium requires many parts working together properly to function and be able to provide a proper living environment for tropical fish. Home Aquarium Supplies offers information and buying tips on all the different parts of a home aquarium to help make it easier to get the right supplies for a perfect home aquarium. The biggest and most important part needed for a home aquarium is the fish tank. The size of tank will determine what fish can be kept in the tank. Your space and budget will determine what size of tank you can get. Learn more about the different options for buying aquariums and stands. Lighting is critical to the well being of tropical fish. There are several different options for aquarium lighting. The type of fish you keep and the choice to keep live or use plastic plants will influence your best options for aquarium lighting. Learn more about different options for buying aquarium lighting. Good filtration is vital to keeping your water clean and fish healthy. Advancements in technology have provided several good options for aquarium filtration. You budget and the size of your tank will help you decide what option will be right for you. Learn more about different options for buying aquarium filters. If you plan on keeping tropical aquarium fish then a good aquarium heater is an absolute must. Most tropical fish live in warmer parts of the world and need warm water. A good heater will keep the water at the best temperature for your fish. Learn more about different options for buying aquarium heaters. Aquarium water needs to be treated to remove chemicals and establish a healthy biocycle before tropical fish can live in it. Various types of conditioners can be purchased and used to remove unwanted chemicals from the water. Learn more about buying aquarium water conditioners. 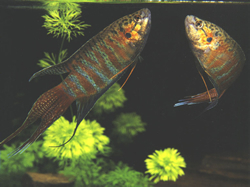 Home Aquarium Supplies is your guide to Tropical Home Aquariums!